With our trick guide we hope to help with your progression. After you have learned how to ride upwind and do your turns it is time for something new. But what? We will explain various tricks, step by step, by showing video’s, pictures and written tips. The first step of learning a new trick starts with visualizing the technique. After you get this, it is time to put it into practice ? The backroll is one of the first tricks with a 360 degrees turn in the air. There are a lot of different variations for a backroll. In this prologue, we will help you with the basic backroll. In short a basic backroll is a backwards 360 degrees rotation. To learn a basic backroll there are 3 important key points; the take-off, the rotation and the landing. We will shortly go through each fase of the trick in this blog. Next to the photo’s and the explanation there is a short video with small tips in it. Don’t steer the kite to 12! & Slow down a bit in speed before you start the backroll. The take-off for the backroll is the point where it starts. Before you are going to take of you place your hands as close to the middle of the bar as possible. When you put your hands in the middle of the bar you will prevent yourself from steering your kite towards the other side during your rotation. The take-off of the backroll is the same as for a normal jump. First you make speed and keep your kite in one position. (around 11 o’clock if you do the backroll to the left or 1 o’clock if you do it to the right) Put your board flat for a second and start edging after, build-up the tension and pop yourself out of the water. At the end of the pop the second fase of the trick starts : the rotation. To start a rotation you have to let the movement come out of your hips, head and shoulders. A small example: imagine you are riding a bike/motorbike your body will follow towards the direction you are looking at. So to start the rotation you have to look over your shoulder. 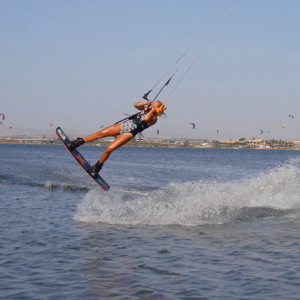 Spot your landing, look to the water and move your front leg downwind. To make your landing smooth bend your knees and continue riding. A video to give a clear overview of the Backroll.